You can make a pencil texture palette into the default texture palette which is added to every new scene you create. This will be saved in your user preferences. Click on the Use as Default Texture Palette button. 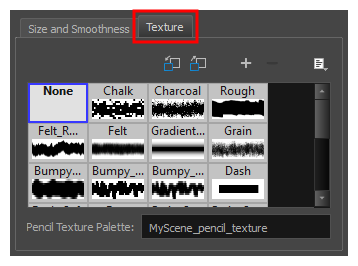 Open the Brush menu and select Use as Default Texture Palette. From now on, new scenes created in Harmony will have the selected pencil texture palette as their default pencil texture palette.